The Ballston Spa Winter Festival and Saratoga’s Flurry Festival are returning this weekend! See what else is going on in the Capital Region with a huge cider tasting, a fun exhibit opening at a children’s museum, a comedy tour, a winter hike, and more. The annual Ballston Spa Winter Festival takes place this Saturday! 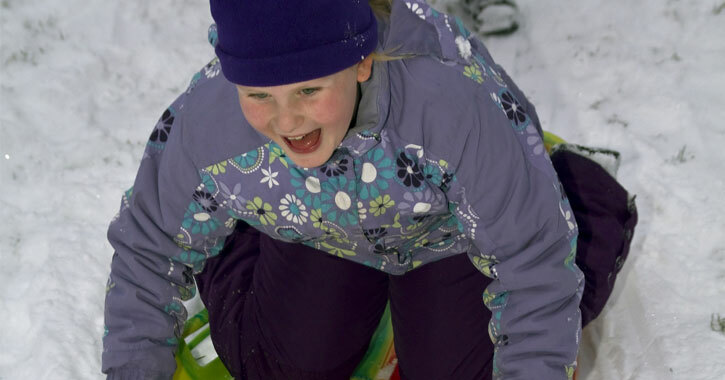 Sledding will be happening, weather permitting, at Bath Street Hill, and then a number of activities will be going on at the Ballston Spa Elks Lodge. You can look forward to an indoor snowball fight fall, games, crafts, and more. Dance the night away at the annual Flurry Festival, happening at the Saratoga Springs City Center throughout the weekend. There will be workshops, singing, concerts, family events, vendors, and much more. If you thought cider was just for the fall months, think again! Nine Pin Cider in Albany is presenting its fourth annual Gathering of the Farm Cideries, the ultimate cider tasting event. Tickets are $25 in advance or $30 at the door. DeFazio’s Pizzeria and The Hungry Traveler will be on site with great food, and 102.7 WEQX will be providing entertainment. The Wonder Room in Ballston Lake is presenting the Snow Sisters Valentine’s Picnic and Playdate, which includes two hours of play time and activities with the Frozen princesses. The group will be coloring Valentine’s, decorating cookies, singing, dancing, and more. The cost is $16.50 per child over 18 months, parents get in free, and they’re asking guests to bring their own picnic lunch. The butterfly exhibit returns to MiSci in Schenectady this weekend! Get ready to see hundreds of brilliantly colored butterflies as you and your kids learn about the different stages, food they eat, and more. Local comedians Makenzi Berg and Robert Yerry join Enresto “Big Ern” Galano and nationally acclaimed comedian Mike Bova at the River Street Pub in Troy. Tickets are $10 in advance, or $15 at the door. If you’re into winter hiking a guided hike will be taking place at Moreau Lake State Park on Friday afternoon. They’ll be hiking about 3 1/2 to 4 miles. Bring lunch, snacks, and water. While you’re out and about on Friday, consider stopping by the Shenendehowa United Methodist Church right in Clifton Park to participate in a blood drive. This blood drive is sponsored by Nick’s Fight to be Healed, which supports pediatric and young adult cancer patients.